2. If you are already signed in: go to step 3. Otherwise sign in with the Windows Live ID you want to use for Azure. You can choose your existing Windows Live ID or create a new one. 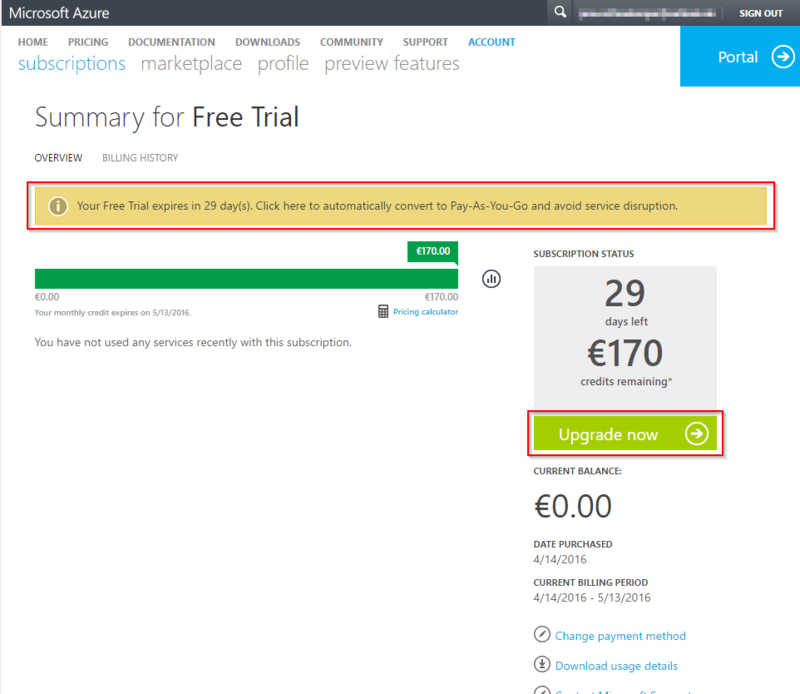 Keep in mind that Microsoft has made it easy to turn your Windows Azure free trial into a standard month-to-month subscription at the end of the trial period. 3. A Sign up page with four steps opens up. Enter your mobile phone number and click on Send text message. When you became the verification number enter it in the field below (will appear after it has been sent). Set the check box of I agree to the… box and click Sign up. 4. 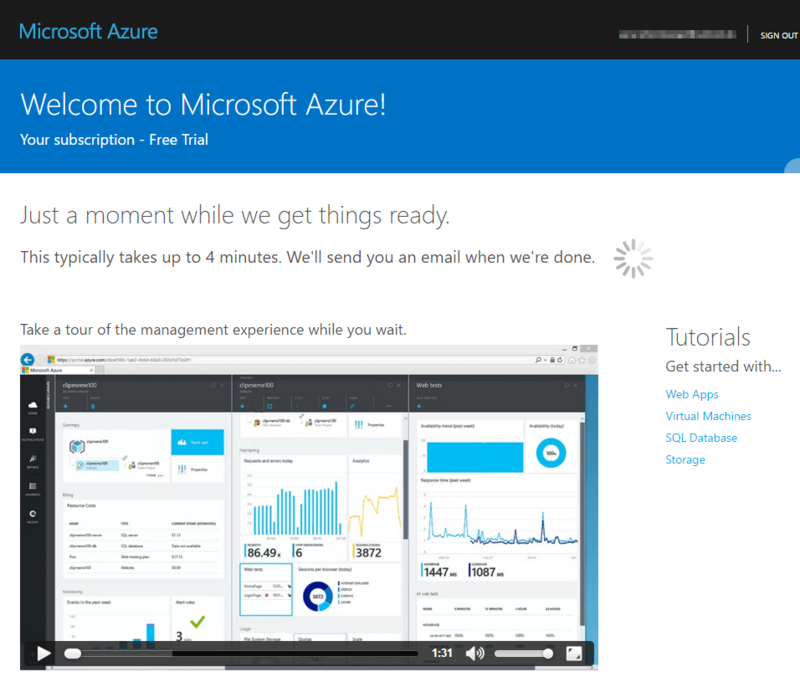 A page Welcome to Microsoft Azure! appears while the subscription is prepared. This takes up to four minutes. Let this windows open and then the page headline changes from Just a moment while we get things ready to Your subscription is ready for you! Click on Start managing my service. 6. The page Subscriptions opens up. 7. On the subscription page from step 6 click on your newly created subscription Free Trial. With the following step it looks like as if some costs may appear. This definitely could take place. Microsoft had some billing issues back in 2013, and one can’t be sure how proper they work now – for me it all worked fine until now. You can see in the notification area the notification Your Free Trial expires in 29 days. Click here to automatically convert to Pay-As-You-Go and avoid service disruption or in the tasks area the button Upgrade now. Click on one of them to upgrade. 9. 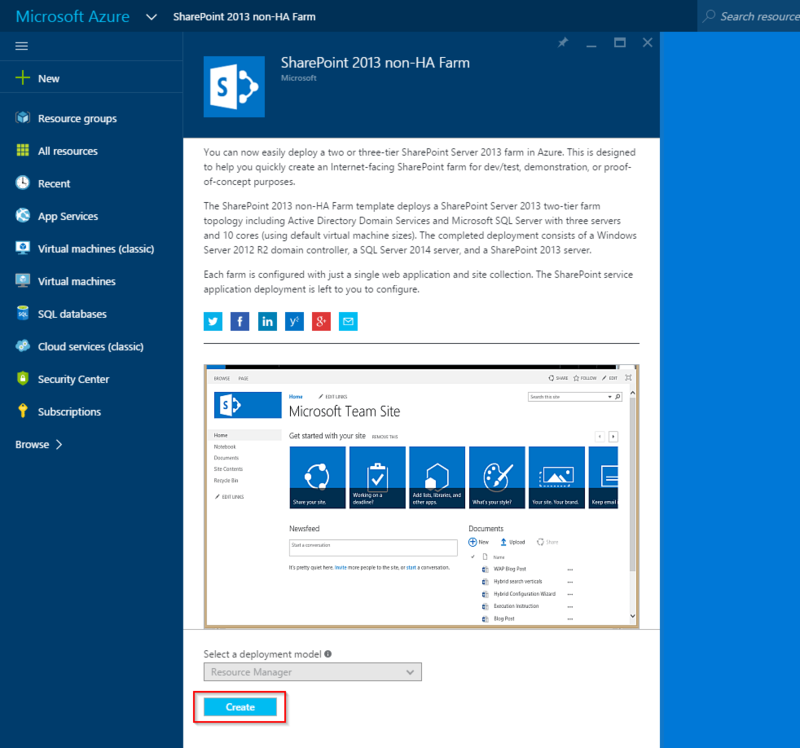 Go to the Azure template SharePoint 2013 non-HA Farm here and click on deploy. 10. If you are not yet logged in: a Sign in page opens up. 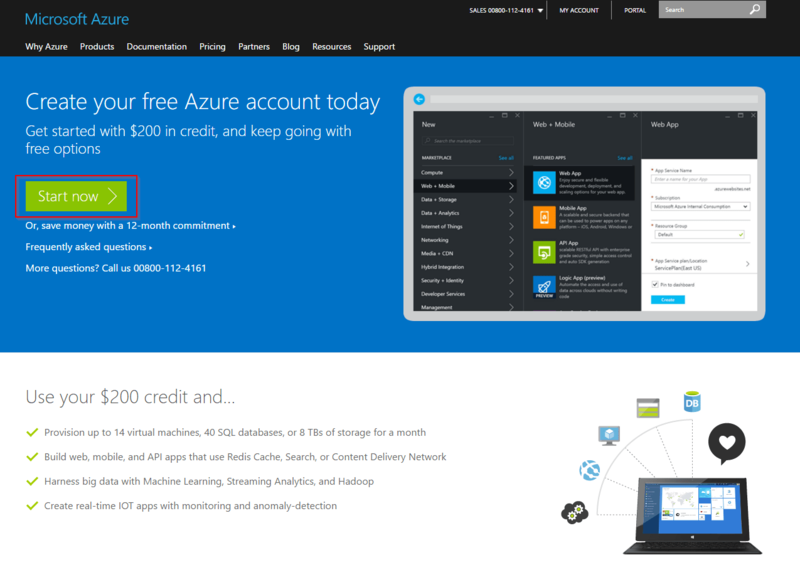 Enter the credentials you used for the Azure trial account. 11. 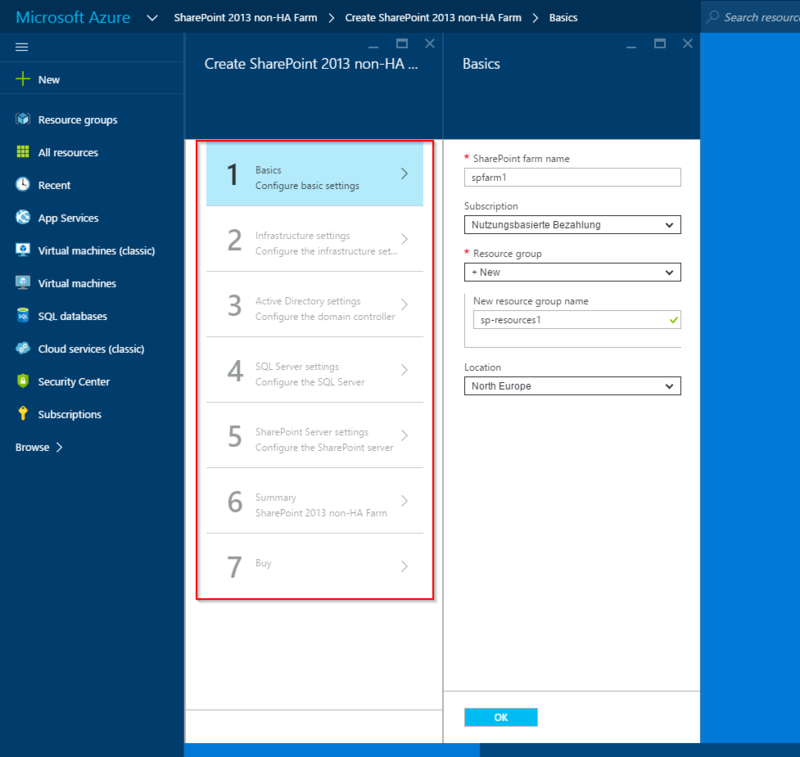 The SharePoint 2013 non-HA Farm pane opens up in the Azure Dashboard. On this pane click Create. 12. 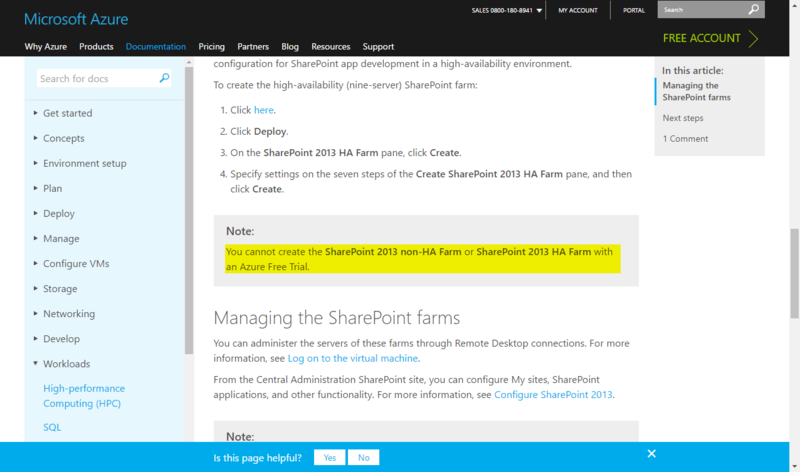 Now you can specify settings on the seven steps of the Create SharePoint 2013 HA Farm pane. I assume you have already set up a SharePoint farm so I won’t describe the steps in detail – they explain themselves. Only three things are a little bit tricky. In step 2 in the field Username don’t take your name but a SharePoint setup account name. In step 5 under DNS label take a URL of the Content site template you’ll name at the bottom, not Central Administration. In step 6 it will check the configuration and then throw an error QuotaExceeded. It’s because only 4 cores per region are allowed. Since you grouped your resources with the Resource Manager you can’t use two regions. So with the 10 cores all in all the quota is exceeded. But it is simple to solve that: just click on Raise quota (or so).It will open a support ticket automatically. Then it takes around 5 long days till the quota is raised. If they start a discussion that first the spending limit has to be removed then say that you have already upgraded your subscription. That’s why step 8 was necessary. With Azure the biggest costs were created when VMs run. For SharePoint you need a SQL server and this one is quite expensive. That’s why one should shut down the VMs after use. 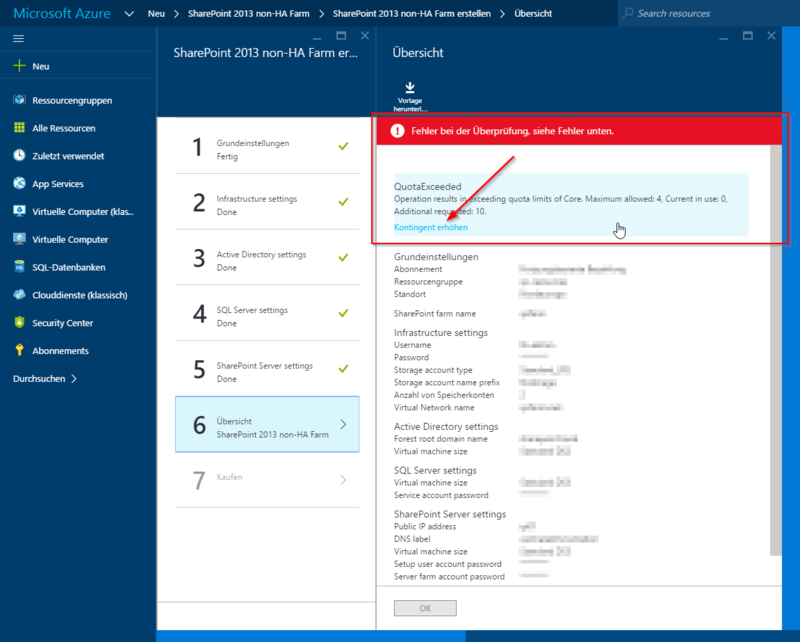 It is important to shut down VMs via the Azure dashboard, not on the instance itself! You can use the PowerShell cmdlet “Stop-AzureVM” for it as well.